Paperboys: “Pie” they called him, though sometimes it was “Pie Face.” Remembered mostly for his years as a right winger for the Boston Bruins, Johnny McKenzie, right, was reported to have died Saturday at the age of 80. Born in High River, Alberta in 1937, he also skated for Chicago, Detroit, and the New York Rangers in the NHL, and for a bevy of WHA teams, including the Philadelphia Blazers and New England Whalers. 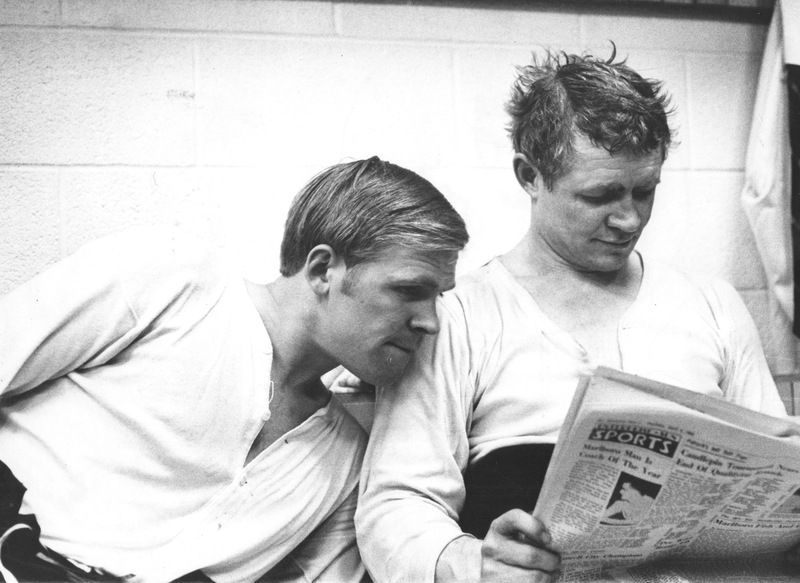 Here, in Bruin days circa 1969, he peruses a paper alongside teammate Glen Sather. “Pesky” is an adjective sometimes appended to McKenzie’s name during his career, and “disturber extraordinaire” is a phrase. He won two Stanley Cups with Boston, in 1970 and ’72. It was his birthday, of course, happened to be. I can’t say how much that multiplied the misery for the man in question, if at all, or how much of a sting he still feels, 32 years on from that day in 1986 — like yesterday, April’s last — when, as a rookie defenceman for the Edmonton Oilers, he scored what has become hockey’s most famous self-inflicted goal, which I (obviously) don’t have to specify further due to how notorious it is, though maybe I should all the same (just to be clear) by naming the man now synonymous with putting a puck past your own surprised goaltender: Steve Smith. Calgary was in Edmonton that long-ago day, playing Game 7 of the Smythe Division Final. 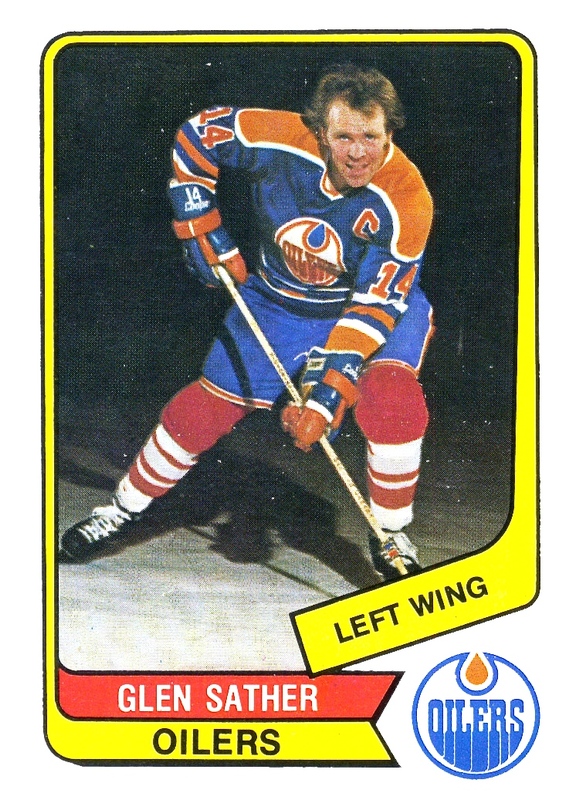 Smith was 63 games into his career with the Oilers, who were hunting their third Stanley Cup in a row. He’d just turned — was still not finished turning — 23. 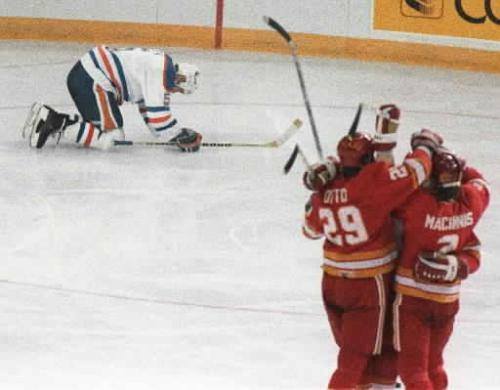 The score was tied 2-2 when, at 5:14 of the third period, Smith found himself behind his own net, rapping the puck off Grant Fuhr’s leg, into that net, to score the goal that not only won the reviled Flames the game but eliminated the Oilers from the playoffs. So, a big mistake. But other defencemen have done what Steve Smith did, in important games, as have lots of forwards. 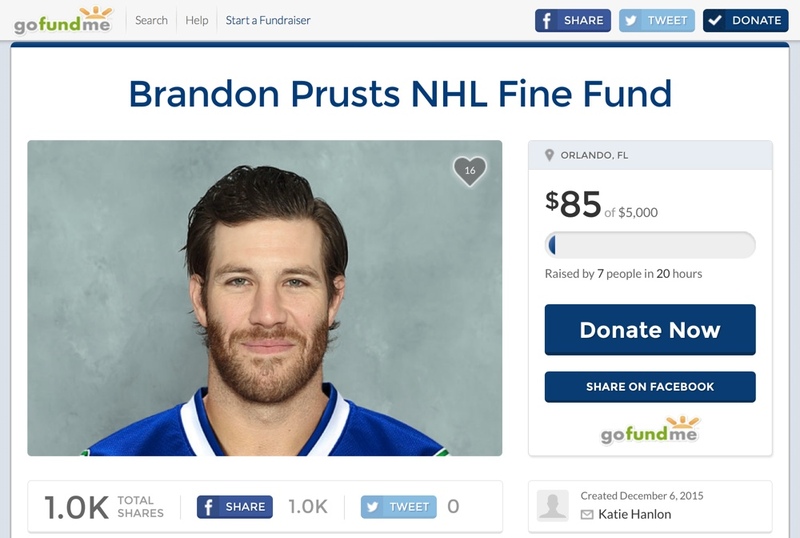 He’s the only one to have had his entire career as a hockey player reduced to a single misdirected pass. As recently as 2016, a writer in a major American magazine referred to Smith as having suffered “perhaps the most devastating embarrassment the NHL has ever seen.”Really — ever? How is it that his goal has become both the exemplar for hockey self-scoring and, for Smith, the act that has come to define an otherwise distinguished 16-year career on NHL bluelines to those of us who were watching the game in the 1980s? And how can that be fair? I take this all a little personally. Smith is a player I’ve followed with special interest since he first skated into the NHL. At first my attention was almost entirely nominal. He’s not much older than me, and grew up in Cobourg, Ontario, just to the south of where I was in Peterborough. I ended up taller; he managed to win many more Stanley Cups than I ever could. It wasn’t hard to imagine his career as my own. No problem at all: I’ve got way more imagination, in fact, than I do actual hockey skills, so it was easy to fancy myself out there, numbered 5, in William-of-Orange/Oiler colours, alongside the most exciting players of the age, Gretzky and Messier and Kurri and Coffey. Smith wasn’t exciting, but I liked his lanky style, which had just a hint, in those early years, of my own trying-too-hard clumsiness. I felt for him in 1986, and maybe even thought I could help him shoulder the burden. I couldn’t, of course — how could I? For a long time, years, any time I got on the ice for a beer-league game I did think demon thoughts about shooting the puck past my own goaltender midway through the third period. I never did it, though I’m pretty sure some of my teammates expected me to, also — especially the goaltenders. Smith’s old goal is old news, but it’s also (like everything else) as current and quick-to-the-fore as your Google search window. Search (go on) and the page that beams up with an efficiency that’s easy to mistake for eagerness shows Smith prostrate on the ice after the goal and tearful in the dressing room. After about 50 viewings over 20 years, I finally see how it happened… Fuhr’s stick came downwards just as Smith passed the puck, and it went off Fuhr’s stick and in, Smith thought there was a lane there to clear it cause Fuhr’s stick was up at the time… does that sound right? i played for steve smith. greatest guy in the world. 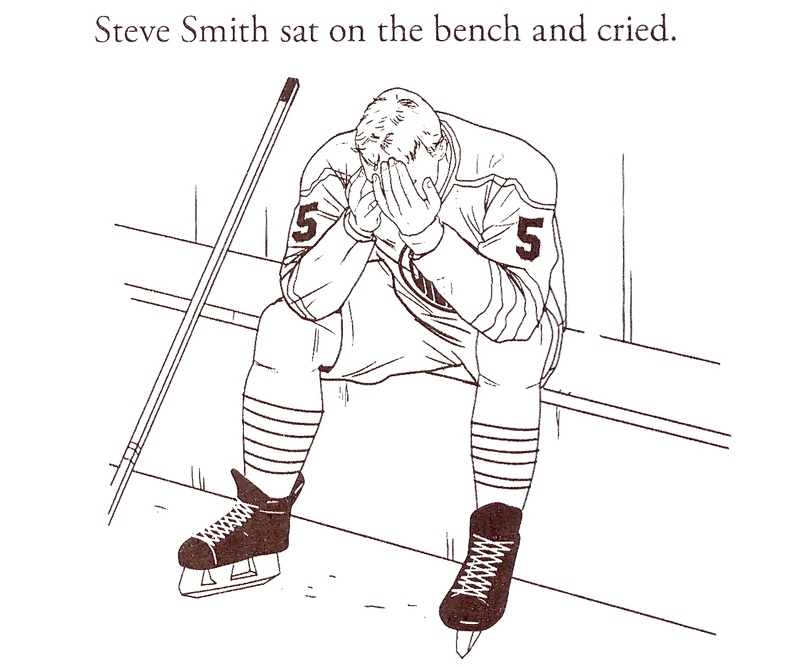 Steve Smith is also the guy who made a dirty play that took Pavel Bure into the boards and hurt his knee. Bure was never the same again. Smith took out the most exciting player in the game at that time, what a jerk. A conclusion drawn by some online commentators on the Smith goal? When Steve Smith passed the puck from behind his net and hit goaltender Grant Fuhr on the back of his left leg, the puck bounced into the net, breaking a 2-2 tie and breaking the backs of the back-to-back Stanley Cup champions. For a lede he went with “one of the biggest bonehead plays in the history of all sport.” There was a lot of that. Infamyis another word that repeats through subsequent accounts of the goal, almost as abundantly as gaffe. Mentions of mortal woundsand witness protection programsfollow on allusions to the caprice of the hockey gods. The Oilers’ collective overconfidencewas seen early on as a contributing factor to what happened to them via Smith’s own goal, along with their arrogance. Smith’s birthday featured prominently in the coverage, e.g. Rex MacLeod’s Toronto Star lede asserting that he will never forget the one in which he aged a lifetime. Often recalled in the aftermath was the fact that Smith only played that night because Lee Fogolin was injured. There was wide acknowledgement in those contemporary accounts that Berezan was the only native-born Edmontonian on Calgary’s roster, and that his birthday was Christmas Day, following which he grew up as an Oilers’ fan. Also: his uncle was the organist at the Edmonton’s Northlands Coliseum. At the time, the Oilers seemed to have no inkling that He’d forsaken them. Over in their room, they were still focussed on the passion of Steve Smith. “I don’t think anyone in this room should be pointing a finger at another guy,” Gretzky also said. “I think you should look yourself in the mirror. Was there not one of those scribbling correspondents who might have stepped up to give the man a hug? After I published my book Puckstruck in 2014, I had several conversations with passersby at bookstore events who saw my name on the cover and lit up under the lightbulb that appeared over their heads. Them: Hey. You played for the Oilers. Me: No, no, not me, different guy. Better hockey player in terms of … everything hockey. And I go by Stephen, mostly. Them: Oh. So you wrote Steve Smith’s biography? No. That’s a book, so far, that’s still to be published. Smith hasn’t seen fit to/hasn’t had time for/has no interest in autobiographying — maybe one day? 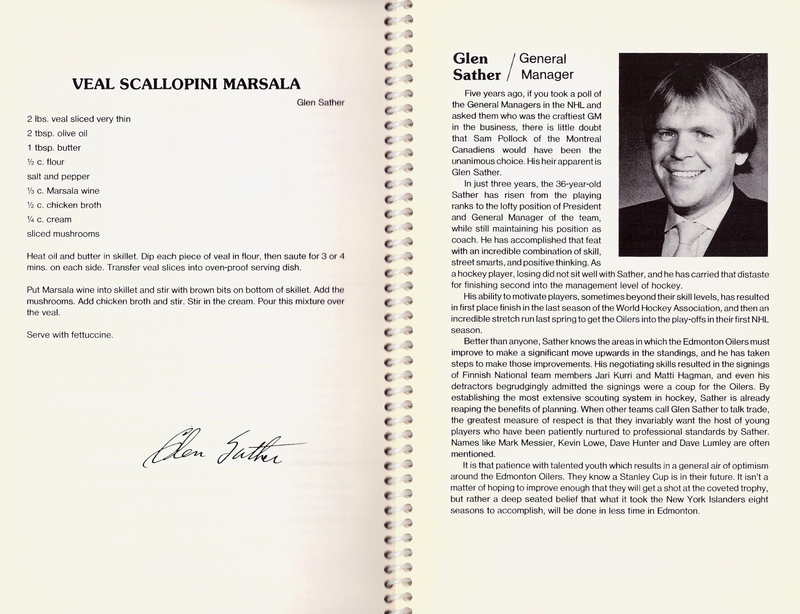 Several other frontline Oilers who’ve written memoirs have, of course, revisited that night in ’86. Steve Smith, our big young defenseman who had replaced the injured Fogie, was behind our net in the left corner looking to make our standard fast-break play. That means the puck goes up the ice pretty quick. Unfortunately, Steve kind of bobbled the puck a bit and he never did get good wood or a handle on it. Since he knew that the objective of the play was to do it as quickly as possible, he moved the rubber without having all the control he should. The puck just sprayed off his stick, hit the back of Grant’s left leg and went into the net. Just like that! He tried a long cross-ice pass, but it bounced off the leg of Fuhr and into the net. Fuhr wasn’t hugging the post and Smith was a little too adventuresome. When the puck went in, Smith dove to the ice, covering his face, looking like he wanted the ice to open and swallow him up. Grant Fuhr has published a couple of books of his own, starting with a manual for would-be puckstops, Fuhr On Goaltending, written with Bob Mummery’s aid and published in 1988. The Smith goal might seem like a perfect teaching moment for such a project as this, but there’s no mention of it, not on the page headed Asleep At The Switch, and not in Communication, either. 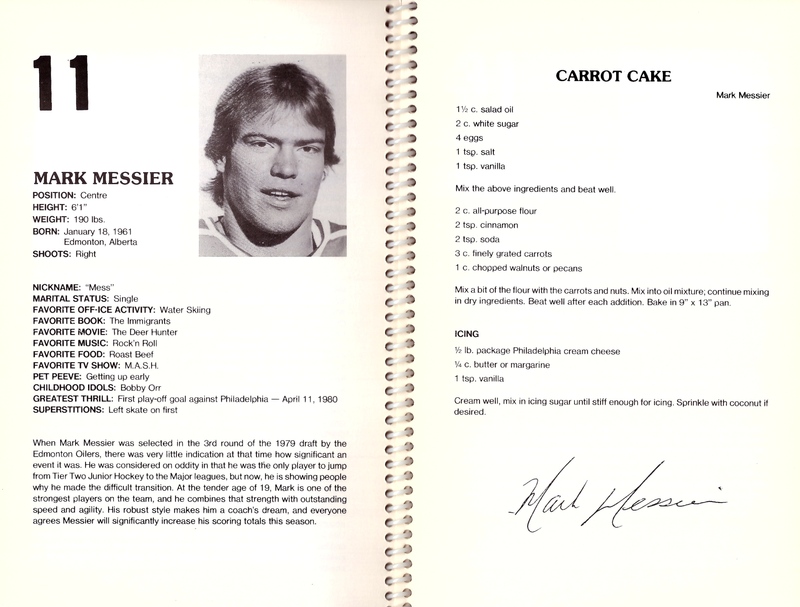 “Be alert, concentrate on the puck, and stay in the game,” Fuhr advises in the former; in the latter, he specifically references teammates handling the puck behind the net. 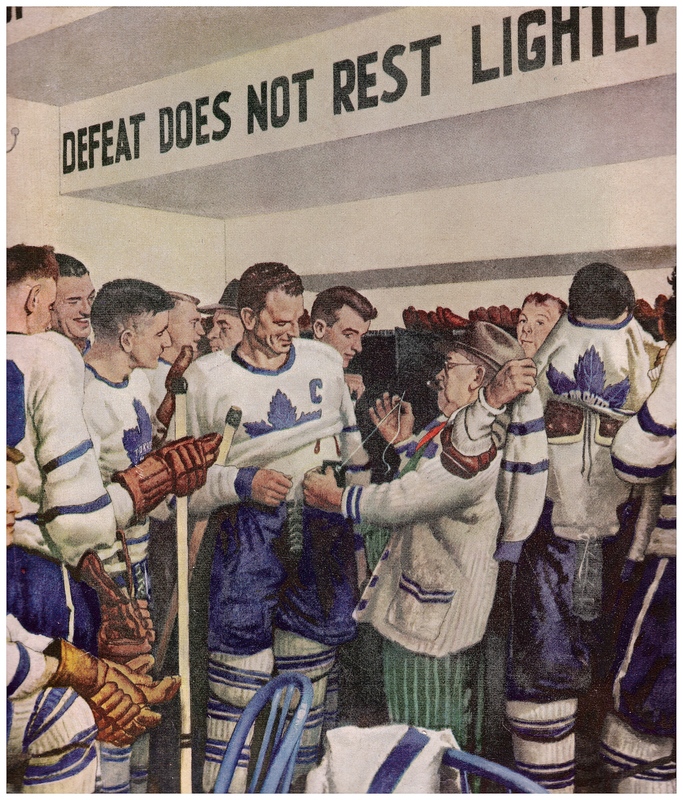 But only, as it turns out, to remind novice goalkeeps that a defenceman back there must be kept informed about incoming opponents. “Keep up the chatter,” he says. In 2014, with Bruce Dowbiggin lending a hand, the goaltender published a fuller memoir. But Grant Fuhr: The Story of a Hockey Legend doesn’t go into even as much detail when it comes to “the lovely Steve Smith goal” as Fuhr did the night of. 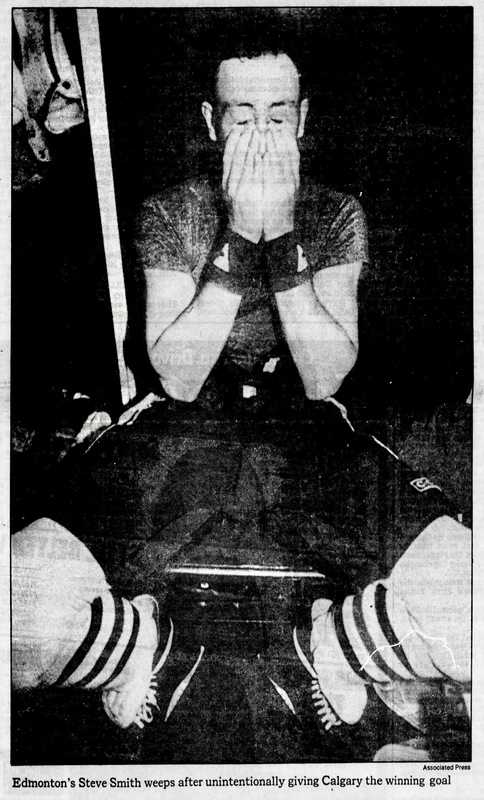 The playoffs, Fuhr concedes, ended on “a crushing note,” which marked “kind of a gloomy end to a gloomy month:” his father had died two weeks earlier. Next up: the Oilers were only a few days into their off-season when Sports Illustrated published an exposé alleging cocaine use by sundry Oilers, including Fuhr. Steve Smith was this big, good-looking defenseman of ours, only twenty-three years old, a future star, a Kevin Lowe protégé. He is a real smart player, but that night he made a mistake. He took the puck in our own corner and tried to clear it across the crease: the cardinal no-no in hockey. It’s like setting a glass of grape juice on your new white cashmere rug. You could do it, but what’s the percentage in it? Without a single Flame around, the puck hit the back of Grant’s left calf and caromed back into our net. Hardly anybody in the arena saw it but the goal judge did. The Flames suddenly led 3-2. It was a horrible, unlucky, incredible accident, but it happened. Steve came back to the bench and, for a minute, looked like he’d be all right. But then he broke down in tears. 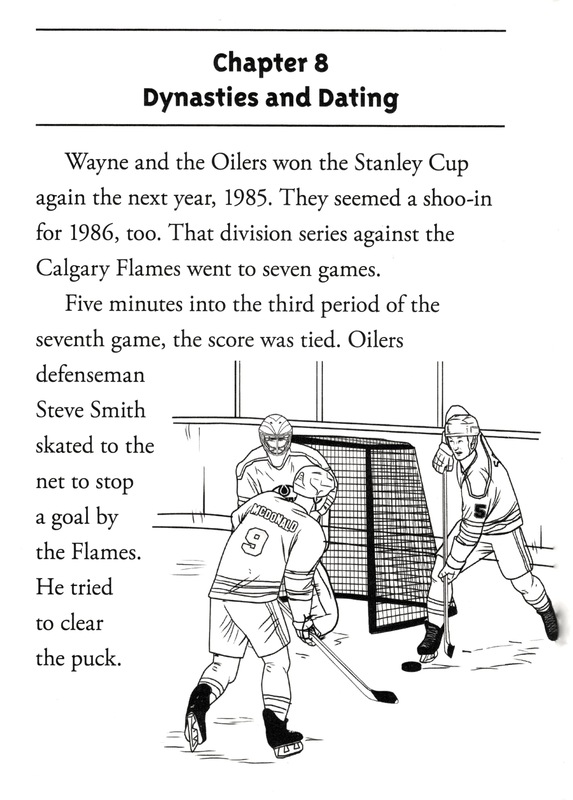 The fact that Gretzky’s most recent book, 99 Stories of the Game (2016, assist to Kirstie McLellan Day), makes only passing mention of Smith, and none of his infamous goal, might seem to signal that the story has been wholly written, nothing more to say. Two books from 2015 undermine that notion. 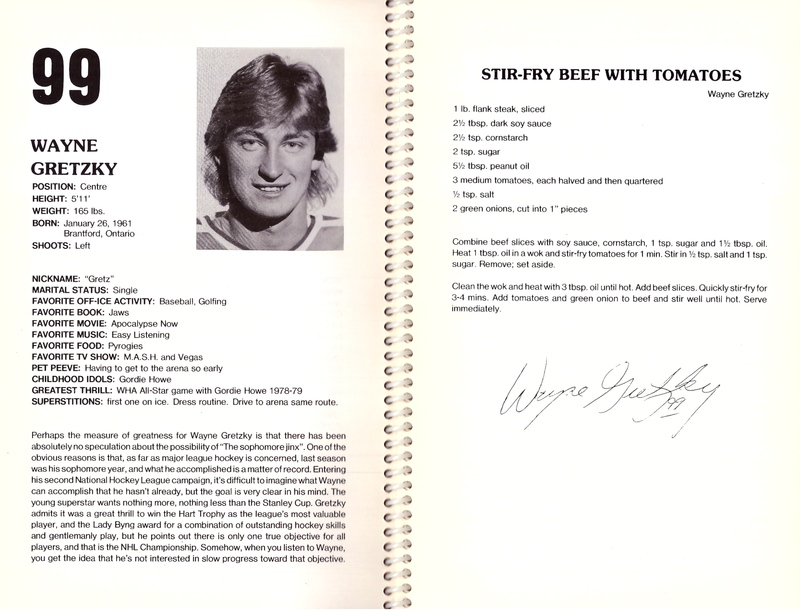 I briefly held out some hope that Gail Herman’s Who Is Wayne Gretzky? might prove to be an existential tell-all by 99’s rogue therapist, but it’s nothing like that. It is, instead, a handsome 106-page biography intended for younger readers. It’s abundantly illustrated by Ted Hammond and (if it does say so itself) “fun and exciting!” The young readers it’s intended for, I’d have to say, would non-Canadian and hockey-oblivious. 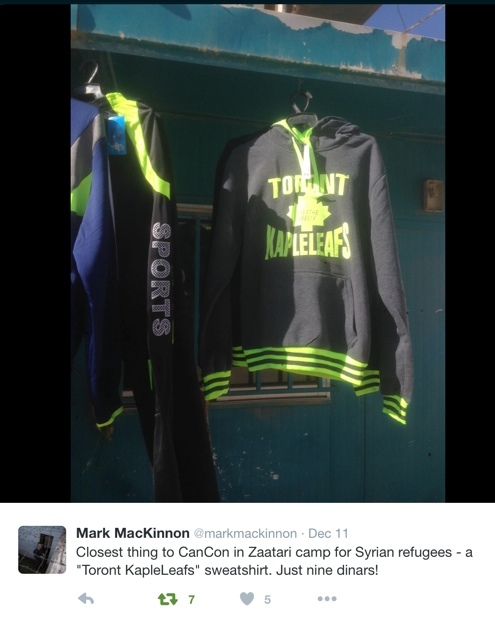 If you are such a youthful person, an 11-year-old, say, living on a far-flung Scotland Hebride that wifi has yet to reach, and yet still, somehow, you’ve developed a curiosity about hockey that so far hasn’t divulged what exactly Brantford, Ontario’s own paragon could do and did, then this is just the book for you, congratulations, and hold on: you are going to learn a lot about Gretzky. You’re also going to come away with a full understanding of Smith’s renowned goal. Chapter 8 is the where you’ll find what you’re after on that count, the one entitled “Dynasties and Dating.” The latter has to do with what followed after Wayne went to a basketball game in 1987 in Los Angeles and this happened: “American actress and dancer Janet Jones came over to say hello.” More important for our purposes here is what happens two pages earlier, back on the ice as the Oilers battle for the 1986 Cup, and well, guess what. Oilers defenseman Steve Smith skated to the net to stop a goal by the Flames. He tried to clear the puck. But the puck hit the Oilers’ goalie, Grant Fuhr, on the leg. Then it bounced into the net. 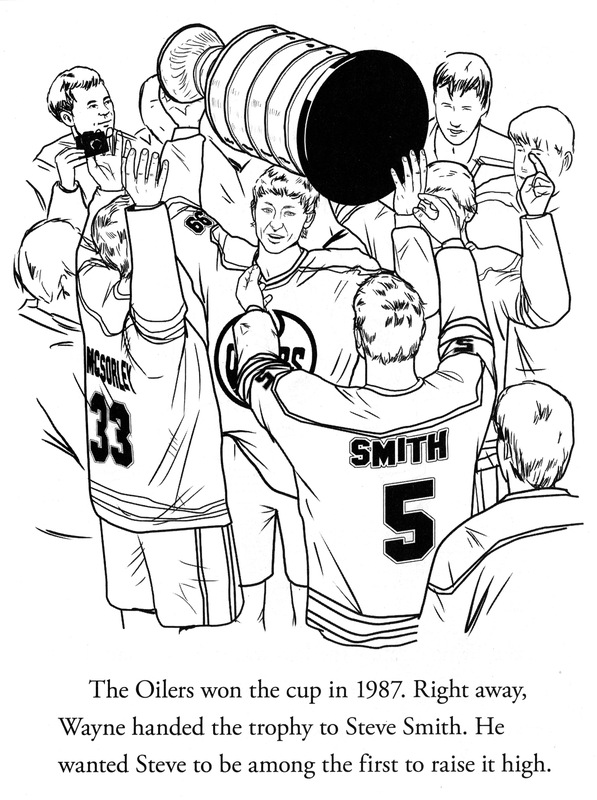 The graphic generosity Herman pays to Smith is worth noting, too: in Chapter Eight’s six pages, he features in no fewer than three line-drawings, which is as many as Janet Jones gets, just before she becomes Mrs. Gretzky in Chapter Nine. Maybe that’s right. But looking back at the contemporary accounts, only the first phrase seems to have appeared in any of the immediate coverage of the game in the spring of 1986. Reporters at the scene who took down “I got good wood on it” tend to have heard what came next as “it just didn’t go in the direction I wanted.” (Kevin Paul Dupont of The Boston Globe heard “but not in the direction I hoped.”) The original is self-deprecating rather than actually humorous, and doesn’t so fully support Spector’s framing premise that Smith was “having a laugh at his own misfortune.” It’s no more than a minor mystery, I’ll grant you. But given the descriptions of the mood in the Oiler room, and of Smith’s own demeanor on the night, I’m skeptical that anyone heard him jibing about the speed of the puck that night. From what I can glean, Spector’s amended version doesn’t seem to have shown up before a 2010 article of Jim Matheson’s in The Edmonton Journal. Otherwise? Spector calls Smith another mobile defenceman who could fight and play. He describes him as gangly. He asserts that he took nothing for granted and (cleverly) not good enough to feel any entitlement. after the Oilers had regained their place atop the hockey world with a seven-game ouster of Philadelphia in the Final, Gretzky made a classy gesture when he handed the Stanley Cup to Smith and sent him off on a celebratory whirl around the Northlands Coliseum ice. Smith persevered and became one of the key players of the team’s drive for three more Cups in 1987, 1988, and 1990. Smith best year came in 1987-88, when he scored 12 goals, added 43 assists, and received 286 penalty minutes. Smith proved he was a tough customer, and the disastrous goal was nothing more than a fluke. And so it happened, in the first period, that Smith lobbed a backhand at Ranford that the goaltender did, indeed, save. Smith raised his stick to the Calgary faithful who, it’s reported, laughed. 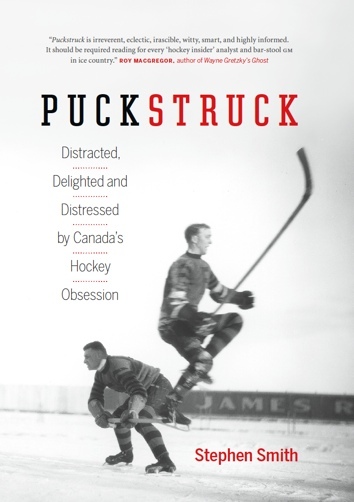 Where once there was only a blog, now there’s a book, too: this month, Puckstruck: Distracted, Delighted and Distressed by Canada’s Hockey Obsession went on sale at booksellers across Canada and the United States. If you get to reading it, and you make it as far as page 402, you’ll find yourself steered back here, to puckstruck.com, for a list of sources cited and quoted. That’s coming next week; stay tuned. The same page in the book also mentions notes and annotations. Those will be appearing here on the blog on an ongoing basis through the course of the winter. They’ll include outtakes, updates, oddments, detours, dead-ends, and goose-chases as well as, like today’s installment, illustrations. They’ll appear first here on the front page of the site, according to no particular schedule, in no special order; later, they’ll migrate to the Notes page, navigable via the contents bar above. They’ll refer to a page number in (and perhaps quote a passage from) the book which, as may already have been mentioned, is on sale now. In my Dave Dryden drawing, when I look at it now, I can see no Dave Dryden. Studying the eyes — well, there aren’t any, just a vacant mask. The rest of his equipment is stacked up artfully, with the help of coat hangers or pipe cleaners. Dave himself didn’t even notice this, or else he was too polite to say anything. 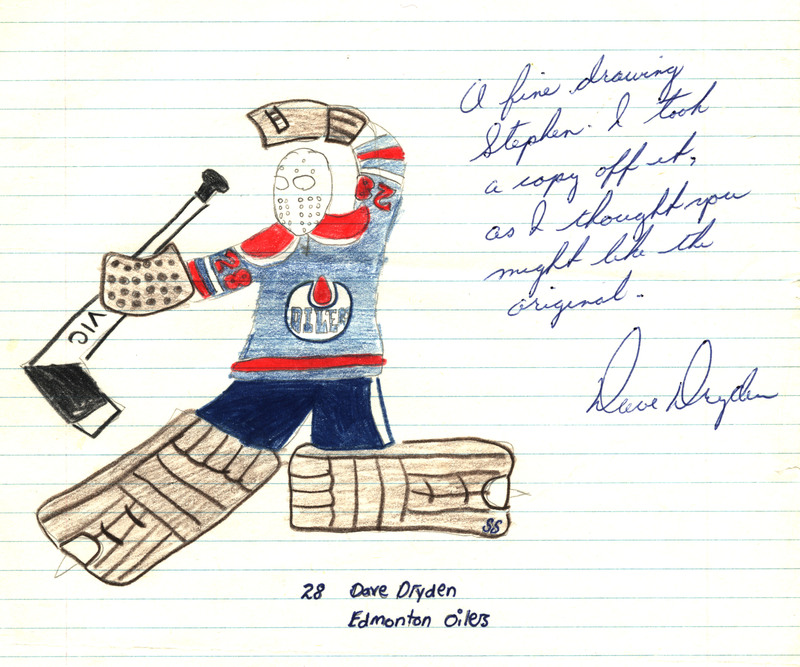 I’d sent the drawing to my grandfather in Edmonton, and he’d passed it on to the Oilers. What was I thinking, sending him a drawing of his empty equipment? He autographed it anyway, and returned it with his regards.